I want to create a rule which is executed only once approximately every hour on one file. Then stops and processes the next file one hour after processing the last file and so on. 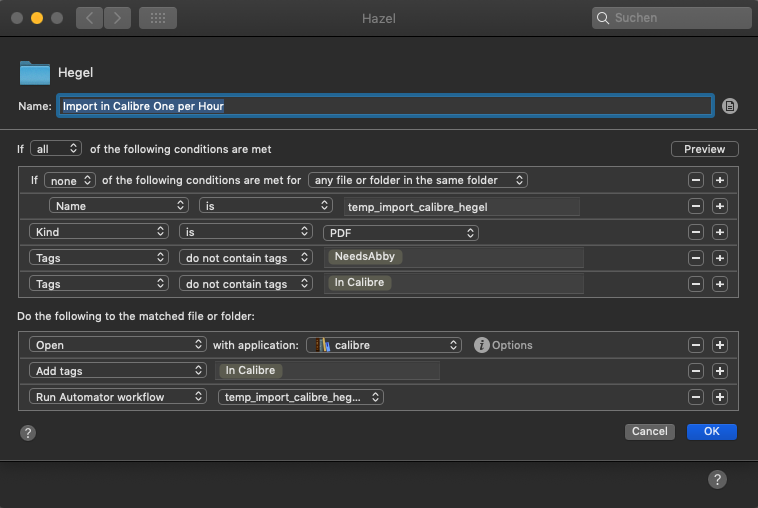 I thought I could do that with an automator workflow creating a text file within the same folder called something like "temp_import_calibre_hegel.txt" every time the rule is executed and tell Hazel not to process if it finds this file within the folder. Then having another rule to delete the text file after one hour, so that the first rule will be executed again. Now I can create the "temp_import_calibre_hegel.txt"-file without a problem, but can't tell hazel not to process if she finds the "temp_import_calibre_hegel.txt"-file within the same folder. Where the "Run Automator Workflow" creates the text file "temp_import_calibre_hegel.txt"
I tried several conditions as "Name contains", "Extension is .txt", "Full name" etc. but it does not seem to work. Does someone has an idea how to solve that? Thank You for all Ideas!! Last edited by Robert on Sun Jan 06, 2019 5:13 pm, edited 1 time in total. Your image didn't show up. It appears to be some sort of Dropbox link, and Dropbox doesn't play well being used as an "embed" link on other sites. its shown to me.. strange.. I added a second picture. Does that one work? You can try something like "Date last matched not in the last 1 hour" to process something once per hour. That said, I'm unclear when you want the next file processed. If you want it done an hour after the preceding file, you will need more complex logic. Also, note that the order in which files are processed is not something you can rely on. Mr_Noodle wrote: You can try something like "Date last matched not in the last 1 hour" to process something once per hour. That said, I'm unclear when you want the next file processed. If you want it done an hour after the preceding file, you will need more complex logic. Also, note that the order in which files are processed is not something you can rely on. As I understood it the "Date Last matched is not in the last 1 hour" counts for every file. So If I have 2000 Files in a directory all files are processed, then Hazel waits one hour and processes them again. That is not what I want to achieve. I want Hazel to process one random File out of 20000 files in the directory, then wait a certain amount of time and then process again one random file out of the 1999 files of the directory, then wait again a certain amount of time... and so on. You'll need a script to implement that sort of logic as it's not really something commonly done. If you are nervous about the results, try it on a copy of the files or keep backups. That way you can verify it all at once without having to wait. Mr_Noodle wrote: You'll need a script to implement that sort of logic as it's not really something commonly done. Not sure if it supports it, but look into using an AppleScript with Calibre.